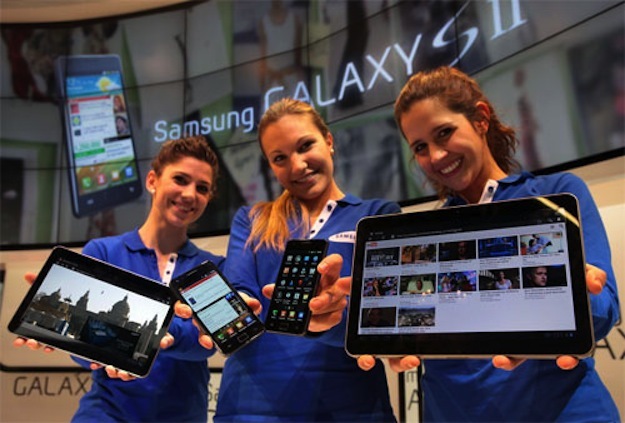 Having fought for a ban on the Samsung Galaxy Tab 10.1 in the Netherlands, Apple is now targeting a complete ban on all of Samsung’s Galaxy range of smartphones and tablets which could see a complete recall of stock from the Korean vendor’s European partners, Webwereld.nl reveals. Apple’s complaint against Samsung, which was filed at The Hague district court in Holland, is said to be more detailed than first thought and seeks an injunction that would ban the sale, import and also require stock of Samsung’s Galaxy Ace; Galaxy S, Galaxy SII, Galaxy Tab 7 and Galaxy Tab 10.1. Also named are the Samsung Gio, Nexus S, 551, Europa, Apollo and Mini but are only included by way of a footnote in Apple’s complaint. Apple demands that Samsung and its subsidiaries send a “letter of request” to all their European clients to recall all infringing products from stock “within 14 days” and offer compensation of the purchase price as well as transport costs. Apple demands that Samsung’s letter should include a statement saying that if clients don’t comply, that they themselves violate Apple’s intellectual property rights. The injunction would severely impact Samsung’s revenues but also affect its European supply chain, as it would need to compensate its retailer and reseller partners as it recalled stock. With no trading of those products, profits could be severely hit. Samsung recently gained a reprieve in its fight against Apple in a separate case after a German court amended its original injunction that banned all European sales, except the Netherlands, of the Galaxy Tab 10.1. The court, not knowing jurisdictional facts allowed the Korean vendor to sell its products again, except in Germany. A decision will be made in The Hague district court on September 15, with any injunctions taking effect on or after October 13.